There are a wide variety of snacks prepared with banana / Ripe plantain. Pazham nirachath is one of the unavoidable snack of Malabar during Ramadan / for Ifthar. Stuffed banana / stuffed plantain is the other name of Pazham Nirachath. It is a very simple and delicious sweet snack of Malabar. Here is a deep fried version of stuffed plantain. The sweet stuffed plantain is well coated with the flour mixture (for sealing the slit) and then deep fried in medium hot oil carefully. 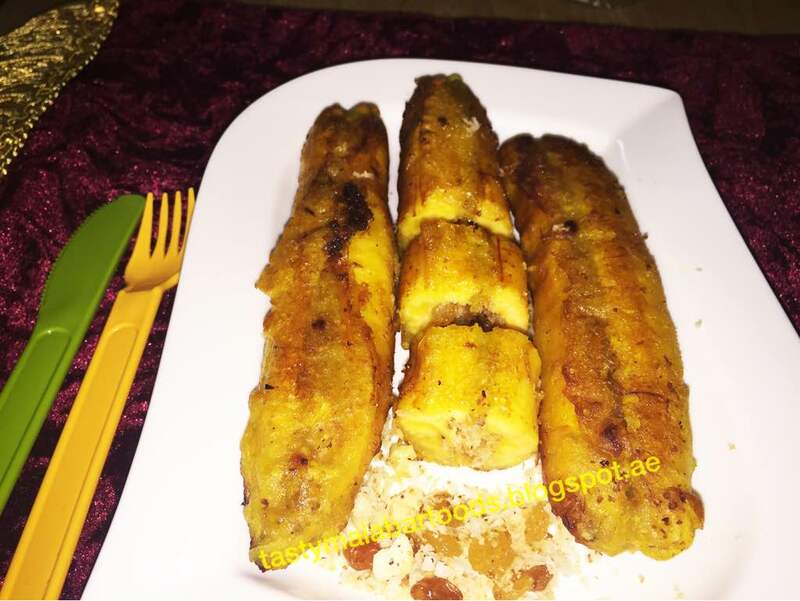 Here is the recipe showing how to make ripe plantain recipe / pazham nirachath / kaaya nirachath/ malabar snacks for ramadan/ stuffed plantain or banana. Heat a pan and add grated coconut (Keep sauteing over a low flame). Then add the chopped cashews, raisins, cardamom powder, sugar to the pan and heat it until the nuts get fried and a fine aroma come(Keep sauteing). Make the flame very low else the coconut will get burnt. Remove from the flame and keep it aside. Now take a shallow bowl and mix together the Maida / all-purpose flour, sugar and salt. Add water to this little by little and make a thick batter out of it, same like banana fritters batter. Peel the banana/plantain and make a shallow slit lengthwise on one side. Remove the center portion with the black seeds. Heat oil in another pan, and dip the stuffed banana in the flour batter and coat evenly. When the oil becomes hot, minimize the flame and carefully drop the batter coated banana. Do not make the flame too high as it will make the stuffed slits of plantain open. Fry them till they become golden brown in color.